On Tuesday, President Donald Trump signed an executive order imposing steep import tariffs on washing machines and solar panels, saying the move showed the United States would not be taken advantage of anymore according to the White House. The tariffs will vary and will be in place for the next three years. The level of the tariffs increase as the number of washing machines imported increases. Tariffs on individual machines could be as high as 50% or as low as 16%. The press release cited the long history of this problem which began in 2011 when Whirlpool Corporation (NYSE: WHR) filed its first complaint. In 2013, the US government found that Samsung and LG were unlawfully dumping South Korean and Mexican washers into the United States. The two companies responded by moving washer production to China. In early 2017, the U.S. Government issued a new antidumping order against Samsung and LG for washers made in China. But, even before the government established those penalties, the two companies stockpiled washers in the U.S. and immediately moved production to Vietnam and Thailand when the penalties took effect. In May 2017, Whirlpool Corp. filed a safeguard petition with the U.S. International Trade Commission (ITC) to end this pattern of serial country-hopping to circumvent trade orders. In October 2017, the ITC voted unanimously that increased large-residential washer imports have been (or threaten to be) a substantial cause of serious injury to the U.S. washer industry. In December 2017, the ITC provided its remedy recommendations to the president who signed the sanctions this week. This calculation assumes that tariff costs will be partly absorbed by international suppliers and/or offset by other operational or supply chain initiatives which would impact the flow through from tariffs to domestic pricing,” Goldman analyst Samuel Eisner wrote. Meanwhile, Whirlpool Corporation Chairman Jeff M. Fettig praised the Trump Administration’s decision to uphold long-standing trade rules by establishing a tariff of up to the legal maximum of 50 percent on imports of large residential washing machines. Whirlpool added 200 new full-time positions at its manufacturing plant in Clyde, Ohio, in anticipation of increased demand following a safeguard remedy decision. The new hires are just the beginning of increased investments in innovation, manufacturing and additional manufacturing jobs for Whirlpool and its vendors. It seems as if the decision will have an impact on the company’s earnings and traders bought on the news. When a stock is expected to be the beneficiary of good news, traders could consider obtaining long exposure to the stock to profit. 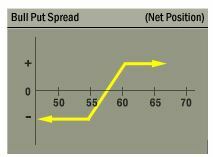 A number of options trading strategies could be used to meet this objective. For WHR, a bull put spread could be opened with the February 9 put options. This trade can be opened by selling the February 9 $150 put option for about $0.45 and buying the February 9 $148 put for about $0.30. This trade would result in a credit of $0.15, or $15 per contract since each contract covers 100 shares. That amount is also the maximum potential gain of the trade. The maximum possible risk is the difference between the exercise prices of the two options less the premium received. For this trade, the difference between exercise prices is $2.00 ($150 – $148). This is multiplied by 100 since each contract covers 100 shares. Subtracting the premium from that difference means, in dollar terms, the total risk on the trade is then $185 ($200 – $15). The potential gain is about 8.1% of the amount of capital risked. This trade will be open for about two weeks and the annualized rate of return provides a significant gain.